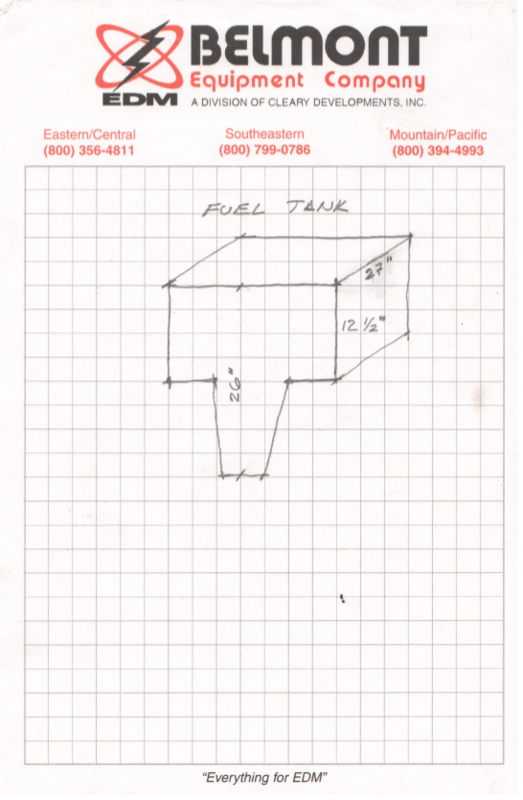 Wow, that is a really excellent and clever way to tackle the tank geometry problem. Kudos to you and your boatwright. I’ve been contemplating replacing my tank for years but the thought of all that cutting around the fiberglass interior makes it a very daunting prospect. What you’ve done is still a big job, no doubt, but I would say you’ve cut the work in half by not having to do all that cutting and repair. I have a question; do you remember how the old tank was attached the the hull? That’s another thing that confuses me. If the old tank is attached to the interior of the hull by some mechanical means, how did you get to the location of the ‘attachment’ when removing the old tank? Along the same lines, how are the new tanks attached? Finally, can you let us know who did your tank? I know you’re west coast but if I decided to do this it would probably be worth the shipping to have it done by someone experienced with this particular design. Thanks so much for sharing, this is quite useful. There’s no welding tabs or similar attachments to the tanks to hold them in place. They are designed for a perfect fit in the cavity. On both the fore and aft sides, there are walls/barriers to prevent the tanks from sliding in either direction. The general “Y” shape of the tank is what keeps it in place laterally. There’s only an inch or so of clearance between the sole and the top of the tank, which holds in in place. 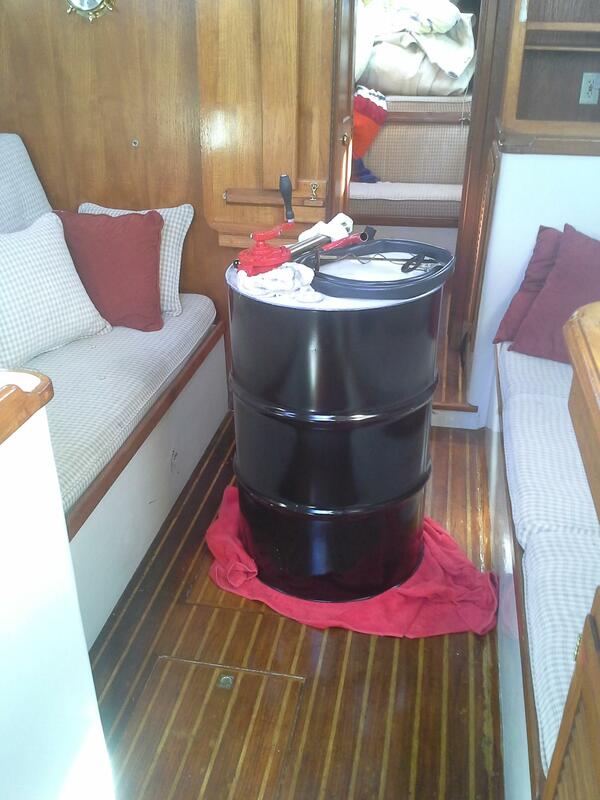 In short, the tank just rests tightly in the hull of the boat, there are no welding tabs to hold it in place. That seems to be the original design of the boat. Private message me on the forums, and I can provide the information on who did the work. I have another thread on the subject, but thought I’d jump into this one since Patrick has done so much work already. I did a rough survey of my tank yesterday using a long stick and a straightened out wire coat hanger. Pretty rough I know. I got more or less the same dimensions as did Patrick. 27 in across (port to starboard) by 27 in fore and aft. But the depth is weird. The main part seemed to be about 12 in (as Patrick found) but the stem of the Y went down to 36 in at one point. I understand the Y shape, but can’t reconcile the dimensions 27 x 27 x 12 is 8748 cu in of only 35 gallons. Patrick said his tank sticker said 81 gal. My owners manuel says 75 gal of which 15 gal are “reserve” (which I take to mean what’s in the stem of the Y or keel cavity). So 60 gal should be in the main section. Is my math screwed up? I will deal with the fuel gage on my other thread. You’re probably correct. I may be overstating this a bit. I do know I hardly go through fuel I haven’t had much of an opportunity to actually assess the fuel capacity. I think we visited the fuel dock a year ago and my needle hasn’t tipped much. The engine in there sips fuel. As I inspected a small leak at the underside of the “Y,” that small leak became a large leak. The tank must come out. Any thoughts or suggestions, any things you would have done differently looking back now? 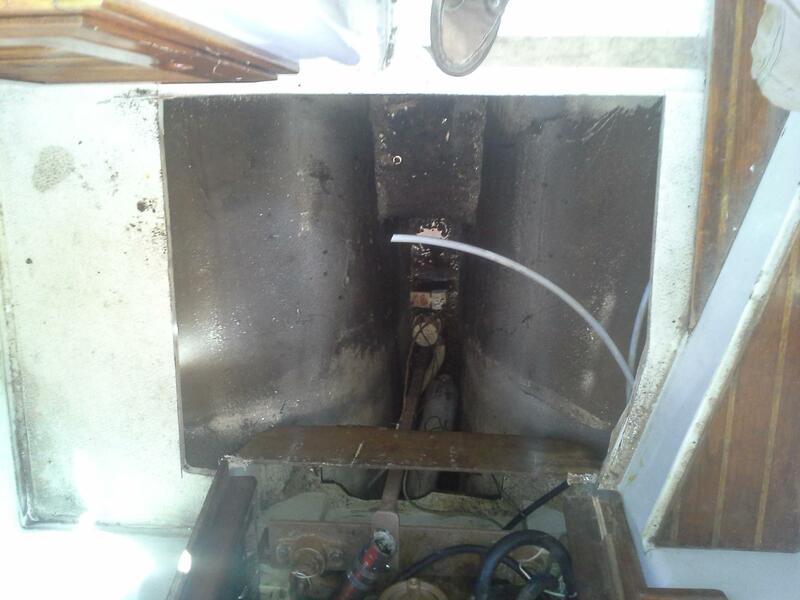 My current plan is to remove the teak & holly (which may be rebuilt as the section near the fridge was in really bad shape when I purchased this boat in 2008) and then cut the floor to access the tank as you did. Is there no way to cut an opening large enough to wiggle the tank out without cutting the tank into sections? I previously cut my water tanks out and am certainly not looking forward to cutting any kind of tank out again, regardless of its contents. 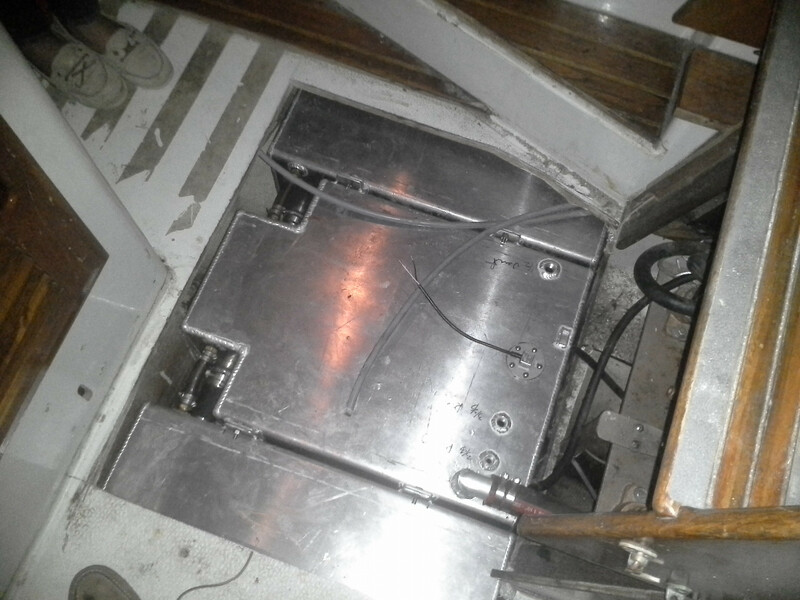 Would you recommend any type of rubber spacer to minimize vibration or direct contact with the hull? Also, I too would like suggestions on who to have build my new tank(s). Do you still have the builder’s contact information? The floor there is a piece of plywood that’s just a veneer with teak and holly. That pops out easily in one piece. You can certainly get the whole tank out, but you could have to cut part of the furniture around the navigation station. The top parts of the tank extend directly underneath the nav station. If you open the hatch under the seat of the navigation station and look down you can see the top of the tank. On the opposite side, you can see the top underneath of the stove. I don’t know what would need cut there. However, yes, it can be done. However, you will have to repair and replace the furniture later. American Tank Co. made the replacements. http://www.americantanks.net/ They’re based in La Mesa, CA and put tanks in just about every boat here in San Diego. I believe they’re a father-son owned business. Thank you Patrick. Later this week, I am meeting with a shipwright who rebuilt and helped me install Loggerhead’s bowsprit a few years go. 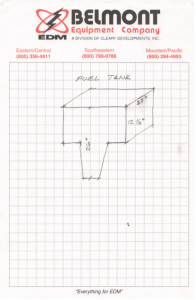 A one piece tank removal and rebuild would be best of course, but I may opt to make the largest hatch possible, cut/remove the old tank (after much cleaning), and then install the largest tank I can squeeze into that spot without loosing too much fuel capacity. Neither are going to be fun. Thanks again. I did a bowsprit myself, too. I think there are pictures on the forum somewhere. One thing I notice is that the boat sits slightly lower in the stern than originally intended. I suspect that the three tank solution maybe added some weight combined with the newer lighter bowsprit has made the boat a little low in the stern. It doesn’t help that in the slip the wind is almost always coming directly at the boat so it causes the boat to pitch a little bit as well. None of this seems to have changed much how the boat sails. Thank you Scott. Not looking forward to this one….. but at least it gives me a chance to catch up on some other projects that sailing has been keeping me from.